This is the third dress style dishcloth in the 2012 collection. It’s titled Let’s Go to London. This dishcloth was a Knit a Long last week and I’m thrilled that so many of you participated. Projects are starting to show up on Ravelry and also in the Yahoo Group for Dishcloth knitters. These dishcloths only take about 2 hours from start to finish and fit nicely on the bottle of dish detergent that many of us keep near the sink. 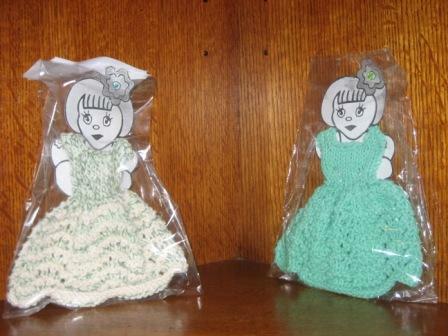 They are also fun for young girls to use as wash cloths. I use Sugar n Cream yarn for these dishcloths. One skein is enough for at least two dishcloths. The one in the photo was completed using Cornflower Blue. They are knit on U.S. Size 7 knitting needles. The 2012 collection is named after places that I’d like to visit. The other dress dishcloths are Let’s go to Paris and Let’s Go to Hawaii. If you decide to make these for gifts or your local craft fairs, I’ve added a download on my website that is a paper doll that you can print and use as packaging for the dress dishcloth. Finish it by placing it in a clear cellophane party bag.